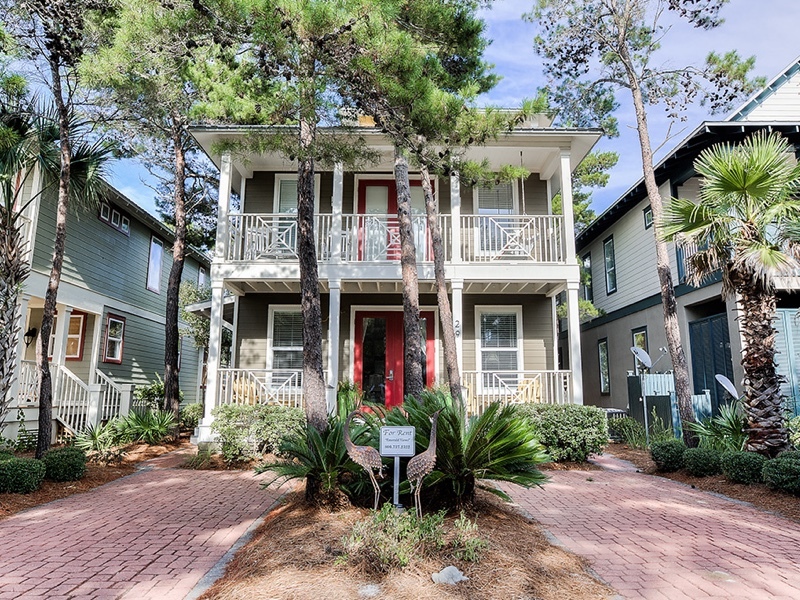 Tucked back in Seacrest Beach, you’ll find Emerald Views Cottage. A lovely four- bedroom, three bath home with more than enough room to relax. As you pull into the drive, Adirondack chairs welcome you to a beach vacation. The open first floor provides all the living, dining and kitchen space you’ll need. Prepare dinner family- style and gather around the farmhouse table to chat about the day’s adventures and indulge in Gulf fresh seafood. Step outdoors onto one of many porches for a quick BBQ or to rinse off in the outdoor shower. A master bed and bath finish out the first floor with a private back patio for lazing about. Walk up the wooden staircase to the second floor where you’ll find a guest room fit for a family. Room amenities include a queen bed and twin bunkbed as well as a private balcony. Across the hall is the second master bedroom with a luxuriously appointed bathroom, complete with rain shower and Jacuzzi tub. Kids will enjoy the third floor loft area with a twin trundle and small private balcony overlooking the rooftops of Seacrest Beach. Emerald View Cottage is steps from the impressive Lagoon Pool and includes access to Rosemary Beach® Fitness & Racquet Club.